The electric vehicle (EV) revolution is here. If you are in the market for a car, there are plenty of resources to help make your next vehicle an EV. But to fundamentally transform the vehicle market, convert a significant percentage of on-road vehicles to electric, and meet major commitments, like California Governor Jerry Brown’s Executive Order to get to 5 million zero-emission vehicles by 2030, there needs to be more of an immediate focus on the needs of large-scale vehicle operators like commercial fleets. Why care about commercial fleets? Because there are over 120 million commercial or “fleet” vehicles in the United States, traveling millions of miles a day. Not only are they contributing to climate change and local air emissions, they are also costly for taxpayer-funded agencies. A lot of these vehicles are in use by city, county, and state governments, ranging from police vehicles to Public Works trucks to less specialized uses such as a Social Services employee who is visiting families in the community or a restaurant inspector doing regular checks. Since these everyday uses represent millions of daily trips, the impact of transitioning to EVs would have a substantial impact on reducing greenhouse gas emissions and hazardous air emissions. But the use of EVs in fleets, especially government fleets, has been sluggish, even despite the widespread availability of financial incentives like vehicle rebates and local grants and a wider selection of EVs for fleet managers. The burden of getting started is still significant — installing chargers can be expensive. But moving past a few EVs to dozens or hundreds of EVs in a fleet has its own challenge, which hasn’t yet been adequately addressed and could be solvable through technology and a structural change or two. This is where startups, utilities, or other innovators can really make a difference by creating the new tools needed to get wide-scale deployment of EVs into fleets. Anyone who manages a fleet of vehicles can tell you exactly how much they spent on fuel in the past year. But it’s not that simple for EVs, especially if your local electrical utility has Time of Use (TOU) pricing. TOU pricing means that instead of paying one price for electricity regardless of the time of day, the price of electricity changes based on what time it is. 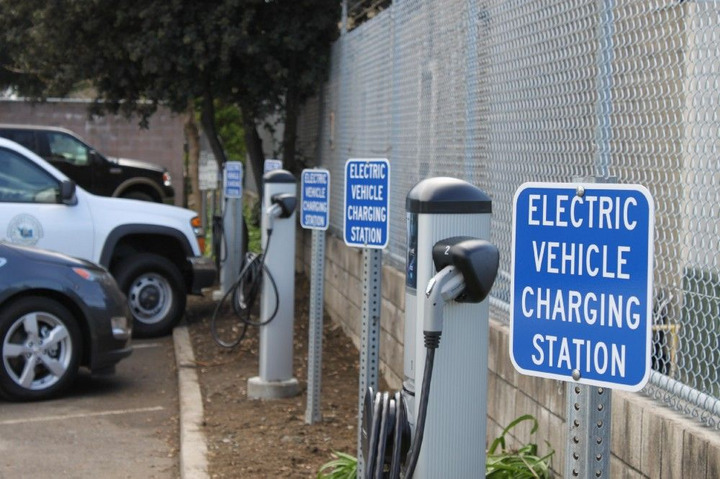 Fleet managers might also be dealing with multiple utility price structures if EV charging stations are located at multiple locations (your utility likely charges office buildings and garages differently for energy), further complicating the ability to calculate costs. With rates that vary based on location and time of day, the price schemes that come into play when charging EVs can multiply quickly and make accurately tracking electrical fuel costs next to impossible for large organizations. Here’s an example. Say an Alameda County employee uses an EV in our fleet and plugs it in when she reaches her destination, charging the car between 11 AM and 1 PM. She then drives it back to her office, where it charges again overnight. The time that her EV was charging spanned three different rates (partial-peak, peak, and off-peak) at three different prices. The cost of gas is highly volatile, but it doesn’t change multiple times in a single day! Combining EV electrical “fuel” consumption with smart energy systems that can accurately track consumption over variable rates at multiple locations is critical for fleet managers to track real-world electricity fuel costs and quit the guesswork. A significant problem with EVs in fleets is that some applications can’t afford to have planned downtime to charge. Imagine this scenario. You are a police officer or EMS employee and you receive an urgent call. Unfortunately, the electric vehicle that you are using has a low battery and needs another 20 minutes to charge. This an unacceptable situation when lives are on the line. The potential for this to occur, even if rare, can be enough to deter fleet managers from using EVs in these applications altogether. One way to solve this problem is to have a variety of charging stations available that can accommodate different needs in a fleet and be deployed where they make the most sense. For example, at Alameda County we’ve installed high “Level 3,” medium “Level 2,” and low-power “Level 1” charging stations, over 130 in total and many more on the way. This means that people who are going to park an EV for several hours can charge up at a low-power station without incurring expensive energy costs, while those with more pressing needs can charge faster. But commercial fleets still need a wider variety of options to recharge EVs faster, when needed. Newer charging stations that provide extremely high levels of power will be helpful to reduce downtime for charging, but can be prohibitively expensive without energy controls. Battery swapping, where EVs that are low in charge can have their batteries quickly swapped for fully charged ones, could be a tipping point for fleets that allows EVs to be utilized for constantly in-use vehicles, such as law enforcement. Making the process of “refueling” an EV as seamless and quick as filling up a tank through battery swapping or very high power charging opens the door to many more applications for EVs. Some electrical utilities levy what’s called “demand charges” on top of electrical usage costs. In the fleet world, this would be like paying an additional fee just to turn the fuel pump on, before you start to fill up a tank of gas. In many ways, these fees make sense because they deter spikes to the electrical grid and have even encouraged us to test new energy load management systems. But they are extremely costly. A single mistimed charging event can cost my fleet up to $2,000 in summer months! Energy utilities need to reform these costs for commercial fleets that are deploying EVs. Doing so will encourage responsible energy usage without deterring progress to wide-scale deployment. If we are going to meet major commitments like Gov. Brown’s goal of 5 million zero-emission vehicles on the road in the next 12 years, we’ll need a lot more vehicles transitioned quickly. And commercial fleets are in the perfect position to deploy at scale. With better data, new charging options, and changes to electricity pricing, fleets can help lead the way. For more information on how transportation organizations like fleets and logistics companies can prepare for mass deployment of EVs, please check out this guide that I co-wrote with Prospect Silicon Valley and Climate Corps Bay Area fellows. Phillip Kobernick is the logistics and fleet manager for Alameda County, Calif., a sustainable transportation expert, and electric vehicle advocate. This article originally appeared on Medium. Related: Electric Powertrains Are the Future. Will Fleets Be Ready? I asked members to sponsor the lunches at our meetings — I didn't realize this was an ethics violation. Recently, my staff and I concluded a meeting that I wasn’t necessarily looking forward to. Our meeting concerned our utter frustration with having to maintain a constantly aging fleet with limited labor resources. We found ourselves meeting to discuss extending the PM intervals not because it’s optimal for the equipment, but to cope with an increasing labor requirement and a reduced labor force. Have you begun to notice that your employees are becoming more tense and uptight? Do they fly off the handle at even the most insignificant of issues? As I talk to my fleet friends from around the country I am getting a sense of employee frustration at levels I have never seen before in my fleet career. First, and to put it rather bluntly, virtually everything they listed is subject to interpretation and variation. While there are some variables that appear very reasonable, nearly all of them could be altered positively or negatively. Let’s look at the each variable individually. With todays reduced manpower and funding levels, several fleet managers that I know have extended their PM Service intervals as a means of coping with their new reality. If you have the time, please respond to the brief questions listed below.